Air Force Capt. Michael Nayak, a third year Ph.D. candidate in Earth and planetary sciences, won the $3,000 grand prize at UC Santa Cruz’s second annual Grad Slam competition. Being able to explain months of complicated research on a gravitationally tangled planetary system named Kepler-32 in just three minutes netted Air Force Capt. 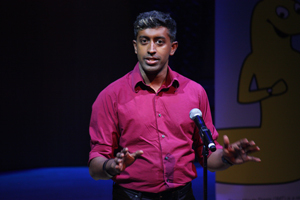 Michael Nayak the $3,000 grand prize as winner of UC Santa Cruz’s second annual Grad Slam competition Wednesday evening. The third year Ph.D. candidate in Earth and planetary sciences stood in a circle of light on the Music Recital Hall stage to describe his research, which not only showed that moons can exist in a system where the gravities of five close-by planets constantly fight for dominance but is also giving clues about what those moons might look like. “I’m thrilled,” said Nayak of the win. His win means Nayak will go on to represent UC Santa Cruz at the UC-wide Grad Slam finals April 22 at LinkedIn headquarters in San Francisco. Joseph Stewart, a third-year candidate in ecology and evolutionary biology, leaped onto the stage to collect $1,500 and a second-place win for his talk on the effects of rapid climate change on wildlife and plants while Damla Ozcelik of Turkey, a sixth year Ph.D. candidate in electrical engineering, nabbed the People’s Choice award and $750 for her presentation on optofluidics, which can be used to inexpensively and quickly detect viruses in human blood. 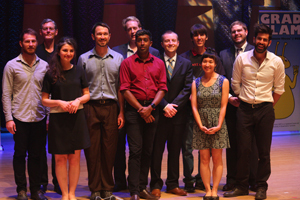 Ten finalists competed in the fast-paced event and were scored by a diverse panel of judges. Participants were allowed one Power Point slide, barred from costumes or song, and marked on clarity, delivery, intellectual significance, and audience engagement. Born from a research communication competition first held at the University of Queensland in Australia, Grad Slams are designed not only to showcase the work being done by graduate students but also to highlight the need to be able to explain research to the wider world. Some 170 universities in 17 countries now hold these types of events. An enthusiastic crowd greeted each of the participants, who stood alone in front of a single microphone in what might be described as the academic version of speed dating. Sarah Beganskas, a fourth-year Ph.D. candidate in Earth sciences, described her work on storm runoff, which is often treated as a nuisance to be re-routed from streets into rivers and seas, but that its capture and return to groundwater could be an important part of a sustainable resource. Andrew Marsh took the stage in a T-shirt advertising a space-based x-ray telescope called NuStar whose data he is using to explore something called the Coronal Heating Problem, which has baffled scientists for 70 years. The mystery is why the sun’s surface registers a temperature of about 5,000 degrees while the sun’s corona is 2 million degrees, said Marsh. “It’s as if the sun was a campfire and the farther you walked away from it the hotter it got,” said Marsh, who is studying nanoflares as a possible explanation for the phenomenon. From exploring the tactics of cigarette companies to keep warning labels off its products around the globe to a look at how diversity in dialogue can boost problem solving, the finalists took an enthusiastic audience on a highlight tour of research being done at UC Santa Cruz. “I thought it was brilliant,” said audience member Niamh Maher (Crown ’17, physics). “It was great to hear the different research being done here, from astrophysics to psychology." Judges included Scott Brandt, vice chancellor for research and professor of computer science at UC Santa Cruz; Bruce Daniels, president of the Soquel Creek Water District; Ted Holladay, vice president and creative director at Hirshorn Zuckerman Design Group (HZDG) in Santa Cruz; Bonnie Primbsch, interim general manager of KUSP radio; Lynda Rogers, dean of UC Santa Cruz Extension; Bill Tysseling, president and CEO of the Santa Cruz Area Chamber of Commerce; and David Watson, owner of The Literary Guillotine and the founder of New Pacific Press.